Learn from our experiences at Valley Creek Church in Denton, TX. They did a pretty good job of welcoming us and teaching about Evangelism! I was searching Google for churches promoting Easter egg hunts, and the results were really dismal. This tells me that churches have a long way to go in understanding their role in publishing content on the web. The next thing I looked for were churches that were promoting their Easter services online. Valley Creek was one of the few churches I found doing a good job. Front and center on their website, they were promoting their Easter services and a sermon series that was leading them into Easter. Also, I had previously heard of Valley Creek Church from a friend, and it looked like they were doing a lot of good things, so I wanted to go there to get some ideas from a church that is doing a really good job. Most of the churches we had visited so far were small Methodist churches, and a lot of them were not doing a very good job. There were bits and pieces of things that they were doing okay, but for the most part, I’ve been disappointed with how they were welcoming us and potentially getting us to come back a second time. We have visited the Fellowship Church in Grapevine, and then Valley Creek Church on Easter — two churches that are doing a great job. Overall, one of the things I’ve learned is that it doesn’t really matter what style of music you have, what color the carpet is, or how modern and how beautiful the sanctuary is. One of our best worship service experiences was at Calvary UMC. You can read the blog to learn how they did such a great job. Basically, there are two things that I’m looking for as a first-time visitor. One is meaningful worship. Did the church do a good job of providing an environment for me to connect with God? Speaking as someone who’s churched — I can’t really speak for someone who’s un-churched — maybe I’m searching for a church, maybe I’ve been in churches before, or maybe I’m moving into the area for the first time and I’m looking for a church. If I came to your church and I came to your website, I would want to know that there was going to be meaningful worship. I think churches do a poor job of expressing this on their websites. There are different things that they can do to enhance that, such as give good examples of the songs that a visitor can expect to sing. The second thing that I’m looking for — I really didn’t expect this at first, but I realized it later on as we’ve been visiting new churches each Sunday — I’m expecting to make some type of personal connection. I have found that the time when I have felt the most welcome and had the best experience at a church service was when the worship was fantastic. I had a great time, I was able to connect with God, I felt the presence of the Holy Spirit, and I knew that God was present at that church. Then what enhanced that and what really hit it home for me was when the people noticed us. They wanted to find out what our story was, they paid attention to us, they connected with us. It was more than just a hello or a handshake; it was, “Hey, who are you and what are you doing? Oh my gosh, you’re traveling in an RV, that’s so fantastic!” They find out our story. At Valley Creek Church, they did a pretty good job on both of these counts. We drove up to the church and, at first, I had a little bit of a doubt because they had a big sign up front advertising their worship service times for Easter. The parking lot was very full and this was supposed to be the second service, so I wondered if we came at the right time. It was cold out this morning, so I left my family in the car and I walked up a guy who seemed to be one of the parking lot guys. He was in his little safety vest, so I was able to identify him; he wore something that told me he was someone I can approach and ask a question. His name was Jim Carter, and I went up to him and asked, “Are you having worship at 10:30 am?” And he said, “Yes, sure.” So I got back to get the family. When I came back with them, he was like, “Hey, is this your first time visiting with us?” And when I said, “Yes,” he said, “Well, here, let me take you in.” So he took us in and then he saw another guy there, Mark. He was a greeter; his job was to take first-time guests and show them around. So Jim introduced us to Mark, and handed us off and told us that Mark would show us around. This was perfect. This was exactly the kind of thing that you need to do in your church. You need to have somebody out in front — whether it’s in the parking lot or at the front door — who can identify first-time visitors, walk them in, and either show them around and give them the grand tour, or hand them off to someone else who can. You really want to make sure that you have someone in place to do that. The idea is if you have someone at the door greeting people and they recognize a new person, if they’re the only greeter there, then they can’t leave their post. You want to have multiple people involved in this process, so first-time guests can be handed off to another greeter if the first one has to stay in place. So Mark was going to take us over to the information desk and get us to sign in, but their desk was very busy that day. They had a very small desk; it was probably only about 4-feet wide. I think that one thing you want to make sure of is the welcome desk where you’re going to take people to sign in needs to be big enough. You need to have something in place to handle a rush of multiple first-time guests showing up. One idea that I had would be to have clipboards. They actually did that; they have a paper sign-in sheet and they had it on a clipboard, but they need to have 20 or 30 clipboards back there. So Mark should know that even if the desk is busy, he can go back there, grab a clipboard, and bring it to us and have us sign in. Then when he’s done showing us around, he can take care of turning in the sign-up sheet to the welcome desk. He didn’t do that. Later on, I went back and signed in just because I wanted to see what else the church would do in terms of welcoming us. So Mark showed us around. He showed us the coffee bar that they had there. The coffee bar was pretty cool; it was interesting. They sell coffee and doughnuts; so there’s no free coffee or free doughnuts at this church. One thing they could have done was as first-time guests, they could have given us a coupon so we could get free coffee and doughnuts, especially for the kids. Or maybe Mark could have taken us to the front of the line and said, “Hey, what do you want?” Basically treating us like we are special guests. They could’ve gone the extra mile to make us really feel important and really feel comfortable. We were in line for about five minutes, and I got restless so I went and signed us in. It turns out, we had some friends that we knew that went to this church, and they saw Tyra and the boys. An interesting thing that happened was out of all the churches that we’ve ever visited, our kids usually get invited to go to Children’s Church or Sunday School, and they’re always like, “No, we’ll stay with our parents.” We always give them the option, but they always choose to stay with us. This time, when I got back to Tyra, she said, “The boys are going with Drew to Sunday School.” Drew was one of the kids that they knew from school while we lived in the Denton area. So off they went to Sunday School. What struck me was this time, they had no problem going because they knew one person. They had a friend that both of them knew, so they went to Sunday School. I think that solidifies another thing that God has taught me along the way: As a first-time visitor, if there’s at least one person who does a really great job at welcoming us, it doesn’t matter if there’s 500 people there. If one person takes the time to really talk to us and make us feel welcome, that’s all that it takes. It’s really a very easy thing, but someone has to take ownership, go ahead and welcome this new family or new person. So if you’re a member of your church, it needs to be you. Don’t wait for someone else to do it or for some program or big mission thing that your church is doing. You start doing it. This Sunday, be that person who welcomes and looks for first-time visitors, and goes out and welcomes them. I think that was pretty much it in terms of Mark. He showed us where to go to worship, and then we were going to get the kids situated, so he left us at that point. Everything was great. The worship was very loud; it was a contemporary worship, so I kind of expected it. It was a pretty small worship space, and they had the volume cranked up pretty good in there. You kind of got used to it, but it was a little loud. The songs were very energetic and upbeat though. It was obvious that the people — the staff and the worship team — had prepared. They loved doing what they were doing. They were passionate about it. They were really getting into the worship. It’s something that’s kind of taken for granted. If you go back to our blog and read about the church, First UMC in Little Rock, Arkansas the worship team, they just did not seem to be into it and it really changed the dynamic of worship. So it was a good thing that the worship team at Valley Creek was really into it. They loved what they were doing, and they were into worshipping God, so it was great! We didn’t know this, but the sermon was actually delivered by video. It was either recorded or it might have been live video. If you go to their website and view the recording of the worship service, it’s the same video that we watched. I have never sat through a worship service where the sermon was delivered by video rather than a live pastor. Everything else was live. The worship team and the music team were live. There was a pastor who was doing announcements and then introduced the preaching pastor. The preaching pastor I thought was excellent. His name is John Stickl. 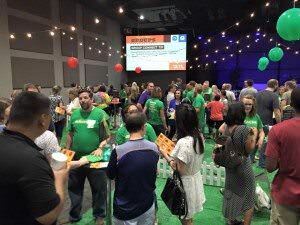 And his sermon was titled, “Hosting a Party.” He said, “I’m going to teach you all how to host the best party ever.” The sermon was basically all about preparing the congregations — the Flower Mound and the Denton congregations — for Easter. They expect worship attendance to double, and they want to make sure that their congregations will be very welcoming and loving to the people who will come in. He went through Luke 14, and basically came up with three different main principles: to invite, to connect, and to serve. I just want to go through some of the principles he was teaching about how to be a welcoming church. Some of these are things we have learned and some are things I want to tell churches. First, I just want to point out something. Something they do is have a prayer meeting; a prayer time where they ask the congregation to come in and do group worship … group prayer. They pray over the worship space, they pray over the foyer, they pray over the coffee bar, they pray over the children’s space … they pray over this church. I’m actually reading a book right now called The Circle Maker by Mark Batterson. In that book, it talks about praying circles around neighborhoods, churches, organizations or whatever it is that you want to be in huge prayer for. That idea struck home with me. Physically coming … not just saying, “Hey, everyone pray for us! Pray for the coming Easter, so that guests will be welcomed and they’ll be loved, and they’ll want to come back and meet Jesus every week.” Instead, let’s physically come in and do the prayer. Let’s walk the church, let’s pray in each space and make it intentional. I think that’s very powerful. It’s not about welcoming, but it shows that they really have a heart for first-time guests or even those once-a-year guests. Another thing to note is that your intentionality to prepare is based on who you’re meeting. Pastor John was talking about all different kinds of meetings, parties, and celebrations. If you’re going for a job interview, you’re going to prepare for that, right? You’re going to dress up, you’re going to read over your resume, you’re going to comb your hair and shave, and all that to prepare. Same kind of thing for Sunday morning worship. He made a big deal about how their worship team spent a lot of time getting ready for worship. Out of the churches that we have been to lately — and maybe this is your church — how much time is actually spent preparing for worship? I know that I can speak from personal experience that I think that the churches we have belonged to have very little worship preparation. The pastor prepares his sermon, sort of in a bubble. The worship team or the band does their own practice. There is no assertive effort to say, “How are we going to bring all these together? How are we going to make this flow? How do we integrate things so that we’re all saying the same message? This is the message that we want to be talking about.” I think when you do that actual preparation, the Holy Spirit comes in and blesses that. It’s just like me speaking to you right now. There are things flowing out that I didn’t really prepare. The pastor mentioned this in his sermon as well that sometimes he gets out there and he’s prepared all this. He knows exactly what he wants to say, but then sometimes the Holy Spirit comes and words start flowing out that were blessed by Him. So I think preparation is a big deal. I think that one of the things that we need to prepare for as a church is for those first-time guests. I’ve seen churches where they have gift bags ready for us, different things like that say they were expecting us that Sunday. I think when you do those kinds of things — just like at Valley Creek when they had those greeters in the parking lot, they had the welcoming minister in the foyer, they had their ushers who took us right to some empty seats because the worship space was completely full by the time we arrived — all of that is about preparing. I think that one of the big things that we miss out on is preparing for that first-time visitor, so I want to do a whole series of training on how to do that correctly. As a church, you have to focus on this. Your focus has to be on the first-time visitor, if you expect your church to grow. So preparation, preparation, preparation. The second thing I want to talk about is connecting people. If I walk into an environment where I don’t know anybody and I meet somebody — or maybe I walk in and I just know one person — in either case, if that person takes me and introduces me to someone else, it really helps me feel accepted and more than just welcome; like the group is actually accepting me and integrating me. If I go to a networking event and someone meets me and says, “Oh, you know what, I see that you’re doing websites,” and they take me and introduce me to Bill or Suzy or whomever, then it gives me a feeling that this group is embracing me; they’re really taking me in. Then all of a sudden, I have friends here; it’s kind of cool. So I think that’s a very important point, a bonus for what you can do to help make people feel welcome. A video training user commented, “Each Sunday can be someone’s first Sunday,” and he’s absolutely right. If you’re doing things right on your website and if you have people inviting their family and friends to your worship, then there should be people who are experiencing their first Sunday every single Sunday. All these things come into play. My overall philosophy is that this Sunday morning worship should be about welcoming first-time visitors; that should be a major, major goal, probably above most other things. There are a lot of other things that need to happen in a worship service, but welcoming first-time visitors needs to be something that’s sprinkled throughout the worship service. It needs to happen beforehand as people are coming in, during the service, after the service — it needs to be there if you want your church to grow. A couple more things on inviting that Pastor John talked about. He said, invite everyone. Those who you think are least likely to show up are probably the ones who will actually show up. So don’t try to pick and choose who is actually going to come. Just invite everyone. Personally, I think that a church’s worship service has to be something that your members are proud to invite people to, right? They have to know that your worship service is going to be designed in a way that people are going to be welcoming, so the whole of worship is going to be welcoming to first-time visitors. You have to feel good about bringing a guest there, and you have to be intentional about it. Pastor John said that 80% of those who were surveyed said that if they were invited, they would come. I looked up the statistic, and I found it — I’m sharing a link to the Back to Church Sunday website where you’ll see the statistics. The very first one says, “Eighty-two percent of the un-churched are at least somewhat likely to attend church if invited.” This was a quote from Dr. Thom Rainer from the book The Unchurched Next Door, which I’ve already purchased; I need to read that. The next one is also very telling: “Only two percent of church members invite an unchurched person to church.” So here’s a huge disconnect. We have 80% of the un-churched out there saying, “If someone invited me, I would probably show up,” but only 2% of the people are actually inviting them. I think there are a lot of reasons for that. One is they don’t really know how to do it. I don’t think leaders in the church are making it easy for them to do it. We’re giving them a lot of reasons not to invite people, but that’s another topic. This is a huge problem and the reason why I want to be doing this ministry and talking to churches about it. Another point he made is if you’re going to invite someone, you’re not responsible for their response. Whether they say yes or no is not up to you; it’s not your business. But you are responsible for the invitation. You’re responsible to actually invite people. He said we need to move from good intentions to genuine invitations. We have to genuinely feel that people need what our church offers, and then intentionally and genuinely invite them to come. The Bible verse that he was reading talked about inviting people to a celebration. And then it also mentioned where this master sent the servants out and he said, “Go out and grab these people and bring them to the party.” The pastor picked up on this and said that there are a lot of times where he will go out, drive around town and see all these restaurants, but don’t give them a second thought. I’m sure you’re like me, like everyone else. There are plenty of restaurants in your own town that you’ve never even been to; you have your set restaurants that you go to and that’s it. But if someone said, “Hey, why don’t we do lunch? I love this place over here, let’s meet there.” Even if you’ve never been there, you’ll say, “Sure, I’ll go.” Why? Because someone invited you. People are not driving by your church saying, “Man, I really should go to that church, I really should go. But, nah, maybe maybe not this Sunday.” That’s not the way it is. They’re not giving you a second thought. They’re driving by, just another building in town; it’s no big deal. To them, it’s just another church. There’s nothing leading them there. Your church sign is not going to do it; that electronic marquee is not going to do it. But if someone personally invites them, they have a good chance of going. If someone says, “Hey, you know what, we’re doing this powerful sermon series. I think you’ll really love it. I would love it if you would come with me this Sunday. I’ll even meet you at the church. What time do you want to go? I’ll meet you there. And you’ll be my guest. I’ll show you around and I’ll introduce you to the pastor. It’ll be great!” That takes a lot of pressure off people. They may think, “You know, that’s a much more comfortable way for me to go to church rather than just showing up on a church’s doorstep.” I think that’s a very powerful thing; I love that Pastor John talked about that. He said people feel valued when you invite them. It’s very easy for people to say, “That church doesn’t want me.” But when you say to them, “Hey, I think you would really benefit. I think you would really love this church. I think you’ll get a lot out of it.” They may have just been thinking, “You know, I need to go back to church.” But without that invitation, without someone saying, “Hey, let me take you by the hand and take you down there,” it may not have been the right timing for them, but they feel that value of someone caring enough to invite them, and they’ll go. Pastor John also said, and this was very cool coming from a pastor of a very big church, “When that first-time visitor comes, they’re going to forget the songs that were sung that morning. They’re going to forget the sermons. But they are not going to forget the way that you made them feel. If you brought them there, if you invited them to come, and you introduce them to people, and you show them around the church, they’re not going to forget that. That experience of some personal connection that they had with you and other people in that church and that other people came over and shook their hand and just loved on them a little bit … they’re not going to forget those. That’s what they’re going to remember.” I thought that was right on the money. It emphasizes what God has been teaching. It’s about meaningful worship and finding connection with people; that’s what a first-time visitor is looking for. He also gave the example of when you go to a restaurant and you have a grumpy waitress, that can completely ruin your experience at that restaurant. You’ll tell people, “Oh, they have bad service there,” because of one waitress. Same kind of thing in your church. If no one welcomes them, if no one talks to them or if someone is rude to them, then they will say that that church is not a friendly church and they would never go there again. They’ll tell people, “Oh, don’t go to that church. They’re not welcoming.” So it’s very powerful; this is a very important ministry in your church. The last part of the sermon was about serving. Pastor John said, how can you welcome these people? How can we be welcoming to our guests? He said this is about serving them, putting their needs before yours. He gives examples like — and this goes for any Sunday, not just Easter Sunday — choose the very worst parking spot you can find. He said the parking lot should fill up from the outside in. In other words, leave the front parking spaces and all the parking spaces closest to the entrance to the church for your first-time visitors. Park where you have to walk 10-15 extra feet or even 100 extra feet … unless you’re not physically able. But if you’re healthy and you can walk with no problems, go ahead and choose that worst parking spot. He says you should choose the most inconvenient service, especially on holidays. The 10:30 am is going to be the biggest service; that’s where most of the first-time guests are going to show up. So go to the earliest service, the late service, or the Saturday service, if your church has one. When you come in for worship, choose the worst seat. Don’t sit up front; choose one that’s on the outer edges. Come on time. He gave an example of you being the host of this party, so you have to be welcoming to people. And you wouldn’t show up to your own party late, so be on time or be early. Come in and be still with God before the service starts to show the importance of how you feel about worship. Other people are going to see that as well. I love that he made the statement, “To follow Jesus, sometimes you have to get uncomfortable.” I think that’s a very easy thing for us to do; to serve other people is to get a little bit uncomfortable. So that was pretty much our experience at Valley Creek Church. I hope that this has been useful to you. If it has, I would love it if you would go to my website, ChurchBuzz.org. Feel free to read more of our blogs about our first-time visitor experiences there. You will also see a pop-up that will ask you to sign up for our church website optimization course. The reason I bring that up is because regardless of whether or not you want that course, if you sign up for that, then you’ll get on our mailing list. As we start doing more training on welcoming people on Sunday mornings, if you’re added to that email list, then you’ll get notified of that training that we’re doing. Please write a comment and let me know how useful this was and maybe what was the best idea or the best takeaway that you got from this. If you have any questions, you can put that in your comment, too. I’m on Twitter as well, @ChurchBuzz. Feel free to reach out to me. You can also email me at patrick@churchbuzz.org. Let me know what you thought about this blog; it would really help me out. Let me know how things are going in your church and if there’s some way that we can help you. Pray – over the worship space, the foyer, the coffee bar, the children’s space, etc. Pray over your church. Prepare – The staff and ministerial team were and passionate about worship. Welcome visitors from the website to walking in the door to throughout worship. Parking lot greeter was friendly, personable, and wore a safety vest (easy to see). Parking lot person handed us off to door greeter. Door greeter took us to Information Desk to sign in. Door greeter showed us around, including taking us to Coffee & Donut Bar. Saw a familiar face who welcomed us and took our boys to Sunday School. Whether a familiar face or someone new, YOU can be the person who takes the time to talk to first-timers and make them feel welcome. Don’t wait for someone else to do it. Invite everyone you know to come with you to church. Most people say they will come if invited. Connect people to people to create a friendly, welcoming atmosphere. Serve visitors by putting their needs before yours. Choose the worse (farthest) parking spot, the most unpopular service time, the worse seat. Be a good host for your church. to several pals ans additionally sharing in delicious. And obviously, thank you to your effort!